The $200 million pitcher is coming. Soon. The only question is whether it will be Justin Verlander, Clayton Kershaw or David Price. Baseball will cross that threshold because the Seattle Mariners on Thursday set a new standard. They had options. They had choices. 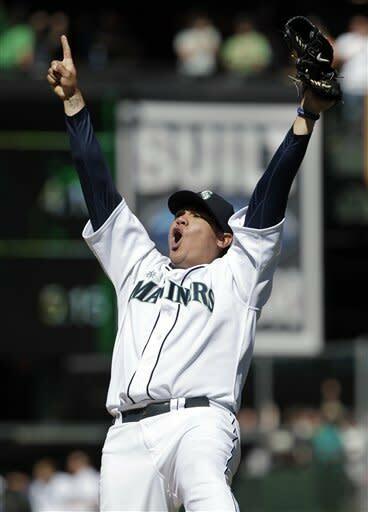 They had two full years left on Felix Hernandez's contract. Which means they could have kept him for both seasons. Or held on until a desperate team forked over a cache of prospects in July 2014. Or rode another year and bubbled over the hot stove with him. Or flipped him for a bounty at this year's deadline. All those choices – all those options – and they still felt compelled to give him $175 million, the biggest sum ever for a pitcher in a deal first reported by USA Today that will keep him as the jewel of the Pacific Northwest for another seven seasons. If Felix made it seven-eighths of the way to $200 million with next-to-no leverage, it's frightening to think what the supercharged moneymaking machine that is Major League Baseball will offer to any of the thankful three. Each has the pedigree necessary for bank-breaking deals. Verlander is the best pitcher in baseball. Kershaw is the best left-hander. Price beat Verlander for the American League Cy Young last season. Check, check, check. While Stephen Strasburg may well break this prerequisite, teams don't want a lemon and thus won't consider for a mega-deal any pitcher who has undergone arm surgery. None of the three has. This is a tough one. Nobody knows how to keep arms healthy, so who is to say that any particular pitcher's arm will stay healthy? For this, teams look at a pitcher's body type, age, the wear and tear on his arm, and a string of beads because only the divine can keep a starter healthy throughout his career. Of the few pitchers who deserve such an extension – and by few, at most five in the entire game – Hernandez fits the profile. He is, amazingly, just 26. In his eight seasons, he has thrown 1,620 1/3 innings and 24,872 pitches – the second-most innings and second-highest total of pitches for a $100 million-plus pitcher behind CC Sabathia, whose $161 million deal he usurped as the biggest. His arm has held up for five 200-inning seasons – and two more with more than 190. Felix Hernandez gives Ferrari performance with Honda durability. That much isn't true of all the pitchers who have signed big-money extensions at similar ages. Johan Santana had the second-fewest innings – 1,308 2/3 – and broke down in the middle of his six-year, $137.5 million deal. Matt Cain wasn't far behind, and he has five years left on his $112.5 million extension – though he also had the most 200-inning seasons. The fewest innings and pitches belong to Cole Hamels, the left-hander signed by Philadelphia for six years at $144 million. On one hand, it's a blessing – less bullets fired from a limb that some doctors believe has a finite amount before it gives out. On the other hand, Hamels doesn't trust the idea that any pitcher is durable, so much that before he signed his deal, he scoffed at the idea of long-term deals for pitchers. "I would give big money, but not for long years," he told Yahoo! Sports in May. "I'd only give three or four years, but I'd give 'em $25 or $30 million." Now that Hernandez has reached the $25 million mark, $30 million can't be far away – especially for a pitcher like Verlander, who turns 30 in less than two weeks and may have an easier time convincing the Detroit Tigers to extend him for $180 million over six seasons than $200-plus million over seven or eight because of his age. Still, executives see Verlander as the perfect pitcher, the heir to Nolan Ryan in terms of longevity and sturdiness, and while he may not pitch into his 40s, he knows free agency will bring a seven- or eight-year deal so long as his arm holds up. Like Kershaw, Verlander is scheduled to hit the open market after the 2014 season, at which time he'll be entering his age-32 season. Not only will he be the oldest big-extension pitcher, he'll have the most innings and pitches. Which is why the smart money for the $200 million pitcher lays heavily on Kershaw. While Price may get it one day, a number of factors work against him. His current team, the Tampa Bay Rays, would never consider such a contract, so it would necessitate a trade – and to the handful of teams that would even consider spending $200 million on something so fragile as an arm. Price also is 27, more than 2½ years older than Kershaw, and has started for just three full seasons in the major leagues. Kershaw is the perfect candidate for a $200 million pitcher. He has the best ERA and adjusted ERA of all the pitchers. He is by far the youngest. He has three 200-inning seasons. His arm is relatively fresh. He can pitch in a big market. His body has grown to weather big innings totals. Of course, Kershaw missed a start at the end of last season with a bum hip, an injury the Dodgers were concerned might lead to surgery. And such is the concern not just for pitchers but any athlete who commands $200 million-plus. Halfway through his latest contract, Alex Rodriguez is on his second hip surgery and facing an uncertain future. Albert Pujols' regression at the beginning of last season frightened an Angels team that knew it had nine more years of him. The prospect of Prince Fielder staying healthy with his body for another eight years concerns the Tigers. And they're everyday players, not guys doing unthinkable things to unstable joints with every whirl of their arm, which they just so happen to do 100-plus times every five days with eight warm-up pitches in between innings and bullpen sessions that add even more strain. There is great danger in being a pitcher, knowing your livelihood and career could vanish with a snap, crackle or pop. It's even more dangerous for a team that shells out $200 million for him. That won't stop them, though. The market doesn't lie. From Kevin Brown to CC to Felix, the path was paved. The $200 million pitcher isn't just coming. He's already here.